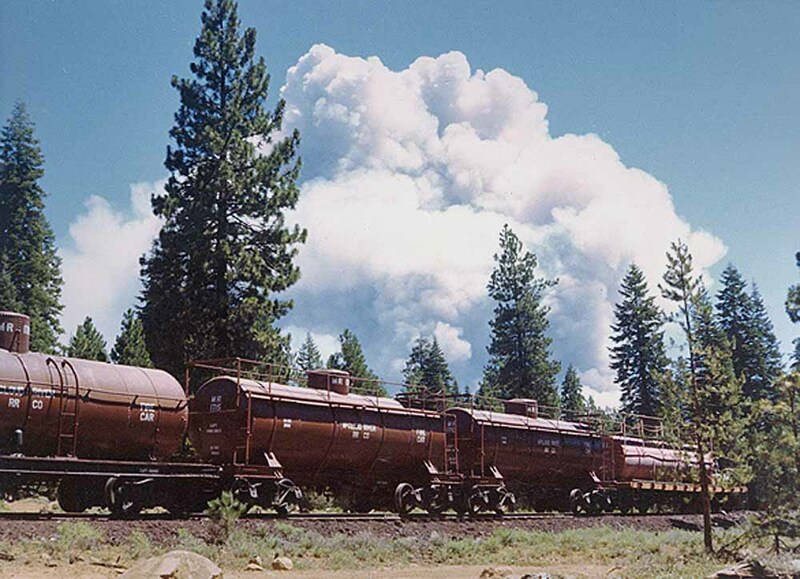 The McCloud River Railroad fire train in Pondosa in 1977, with the smoke plume from the Pondosa fire in the background. Travis Berryman collection. Fire is a natural part of almost all forests on the North American continent, especially in dry pine forests in which the McCloud companies operated. However, European settlers brought with them beliefs about the evils of fire. Fire control became a matter of policy amongst governments at all levels, especially after the great firestorms in Idaho in 1910. Timber and railroad companies operating in fire country were required to suppress fires, and the U.S. Forest Service made assisting the agency in firefighting a term and condition of grants for right-of-ways, timber sales, and other actions requiring agency permitting or approval. The McCloud River companies always took a serious approach to fire suppression. The railroad maintained cars specifically equipped to fight fires, usually standard wooden water cars equipped with pumps, hoses, and hand tools. The railroad's many wood water cars could be used as mobile water sources, as could the locomotive tenders. The railroad equipped all steam locomotives with fire pumps in the early 1920s. When a fire broke out or was otherwise reported along the line, field personnel would report the fire to the dispatcher in McCloud using the railroad's telephone line. Railroad and lumber company officials would round up men from the sawmill and other equipment while the railroad put together fire trains in the yards. The trains would head out to the fire area. The McCloud River Railroad maintained the fire train well into the modern era. Its last use probably came in 1977, when the fire train responded to help save Pondosa from a major fire threatening the camp. In addition to fire duties, the fire cars would also be employed in other duties such as spraying weeds, wetting down the right-of-way during dry periods, and providing mobile water sources for steam locomotives. The fire cars owned by the McCloud River Railroad are listed below in chronological order. 30- On roster prior to 1906. Renumbered 1907 to #1707. 59- Fire car listed in 1907 equipment inventory. Probably a wooden or steel tank temporarily mounted on log flat #59. 1705- Purchased before 1906. Book value $500. Wood tank on flat car body. Converted circa 1927/1928 to fire car #1781. 1707:1- Purchased before 1906. Formerly #30. Book value $450. Likely a steel tank on a flat car body. Converted 6/1920 to oil car #1707:2. 1781- Converted circa 1927 from fire car #1705. Book value $500. Equipped 5/1939 with emergency fire hose at a cost of $138.53. Retired 7/1941, with pump and fire hose salvaged for use in fire car #1711. 1711- Constructed 7/1941 by installing a 6,500 gallon tank car body (origin unrecorded, but possibly salvaged from oil tanks #2021 or #2023) on log flat #2325, along with steam pump and fire hose salvaged from the #1781. Total conversion cost $1022.11. In 1951, the pending disappearance of steam locomotives from the road would shortly deprive the steam pump of its power source, and the company shops replaced it with a Fairbanks-Morse 2-inch horizontal center pump and 32-feet of additional hose at a total cost of $2183.03. Hose reels removed from tank by the late 1970s. Car used in weed spraying and fire suppression and prevention into the early 1990s. Sold 1992 to McCloud Railway. Car rehabilitation in the shops in spring 1994 for use in the special excursion with the #19, then used as an auxillary water source for the steam program from 1997 through approximately 2002, then only in photo freights after that time. Sold spring 2012 to Pacific Locomotive Association, who moved it to their Niles Canyon Railway in August 2012 for restoration and operation. 1713- Converted 1951 from tank car #2007. 8,000 gallon capacity. Car served as part of the fire train on the railroad into the mid-1990â€™s. Did not have pumps of its own, instead supplying water to the #1711. Sold 1992 to McCloud Railway. By 2000, the McCloud Railway had shoved the car partially off the end of a siding behind the shop building, where it was used to store fuel oil for the steam locomotives. Sold 2/8/2011 to Oregon Coast Scenic Railroad. Car remains in McCloud pending transportation to Oregon. 1715- Converted 1951 from tank car #2009. 8,000 gallon capacity, same description as the #1713. Aggregate cost of $249.68 for additional equipment used in converting both #1713 and #1715 to fire cars. Sold 1992 to McCloud Railway. Car has seen no use in recent years beyond special photo freights. Scrapped fall 2013. 1716- 8,000 gallon capacity. Converted 1977 from tank car #2010. Part of the fire train with #1711, #1713, and #1715. Sold 1992 to McCloud Railway. Car has seen no use in recent years beyond special photo freights. Scrapped fall 2013.